A UCF cardiovascular researcher has received a major funding boost for his research into improving the quality of life for cancer survivors and diabetic patients. Dr. Dinender Singla, who also heads the cardiovascular research division at the Burnett School of Biomedical Sciences has received two competitive RO1 grants from The National Institutes of Health (NIH) totaling $5 million for two studies to prevent heart and muscle deterioration as a result of both diseases. The first study will examine whether stem cells derived from mice can reduce muscle damage from a popular chemotherapy drug, Doxorubicin. While it is effective in destroying cancer cells, Doxorubicin can also cause cardiomyopathy, irregular heartbeat and skeletomuscular disease. Dr. Singla’s quest is to discover an effective protection against Doxorubicin’s side effects. Stem cells have been used to treat conditions like heart disease and Parkinson’s, because of their potential to regenerate and repair damaged tissue. In a preliminary study, Dr. Singla isolated exosomes — small sacs outside of cells, from embryonic stem cells and used them to treat heart and skeletal muscles cells that had been exposed to Doxorubicin. Dr. Singla said he believes the exosomes function in two ways – they block inflammation and turn remaining inflammatory cells into healing cells. The next step will be to conduct studies on mouse models to ensure that the stem cell therapy does not impact Doxorubicin’s ability to kill cancer cells. 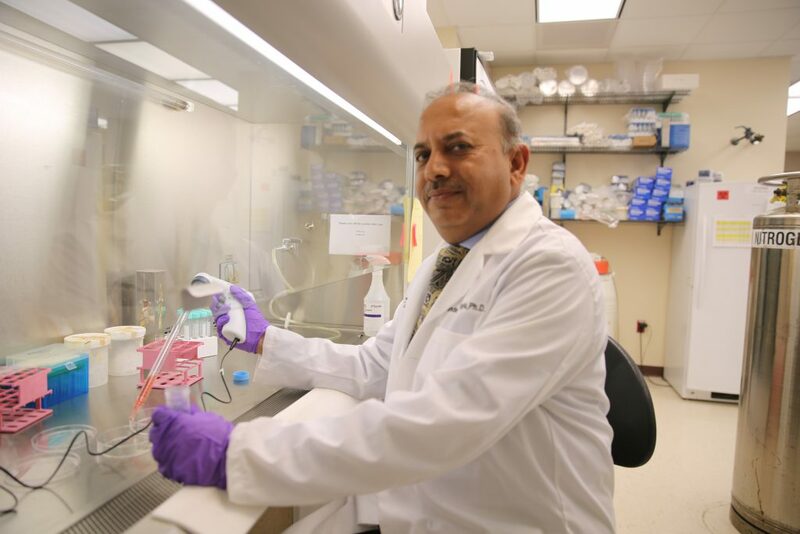 In the other study, Dr. Singla will examine how a protein naturally occurring in the body — bone morphogenetic protein (BMP-7), can be used to treat diabetic patients to reduce inflammation that causes muscle damage and wasting. The effects of diabetes are far reaching beyond high glucose levels. It also causes inflammation that leads to a range of complications including heart disease and muscle deterioration. Current diabetes drugs only treat glucose levels and insulin resistance, so Dr. Singla and his team are working to develop a drug therapy that can reduce the inflammation that causes muscle damage. Using mice that were pre-conditioned to develop diabetes, Dr. Singla administered several doses of BMP-7 over a course of three days. At the end of the test period, Dr. Singla found that the mice had a significant reduction in inflammation. Another beneficial and completely unexpected side effect of BMP-7 was a reduction in the mice’s blood glucose levels. Dr. Singla explains that the BMP-7 works by converting inflammatory cells in the body into anti-inflammatory cells thus preventing further damage. Since the study was done in pre-diabetic mice, further studies will assess the mice as they develop Type 1 and Type II diabetes later on in their life cycle. With the $5 million grants, Dr. Singla is highest NIH-funded researcher at the College of Medicine. R01 grants are the oldest and most prestigious type of cancer research grants.